Blue Note 34, 12-inch, 78 RPM. Record is in VG condition, plays nicely over mostly light surface noise. Labels are good, minor scuffs, age toning. 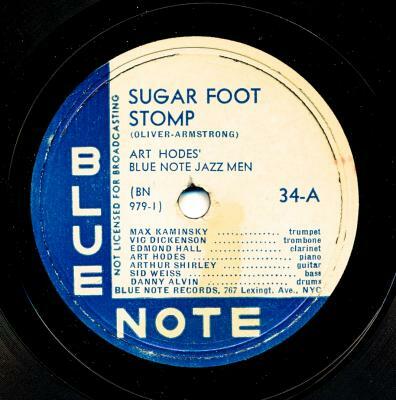 ART HODES' BLUE NOTE JAZZMEN performing Sugar Foot Stomp / Sweet Georgia Brown. 1944 issue; recorded in New York, June 1, 1944. Outstanding HOT Jazz Improvisations on a Hard-To-Find 12-inch Blue Note 78. Terrific and Scarce 12-inch HOT Jazz 78 in Nice Condition.